The government published a report last week linking extreme weather events in 2011 to man made climate change. ncdc.noaa.gov/pdf This report is discussed in articles published by The Washington Post, the Weather Channel and CBS News. An article published by Reuters discusses an information exchange between Chesapeake and Encana that had the impact of driving down land lease prices in Michigan. Warren Buffett stated yesterday that the U.S. economy has flatlined and things are slipping "pretty fast" in Europe. After doing some more research on MLP ETFs and ETNs, I found another one that is in the ETF form of ownership. The symbol is MLPA and the sponsor is the Global X Funds. As noted by Tiernan Ray in his Barrons' blog, data released by Gardner and IDC has emboldened the Intel bears. That data showed a year-over-year decline of .1% in PC shipments for the Q/E June 2012. I own the common, and have no intention of selling as long as Intel keeps raising its dividend. If the price falls below $20 consistently, I will start using the dividend again to buy more shares. China reported that its second quarter GDP growth slowed to 7.6% compared to a year earlier, down from 8.1% growth in the first quarter. (see discussion in Bloomberg article) This was the slowest growth since the 2009 first quarter. Singapore reported last night that its GDP declined an annualized 1.1% in the second quarter compared to the 2012 first quarter. (see discussion in Bloomberg article). The Bank of Korea cut SK's 2012 GDP growth forecast to 3% from 3.5%. It also trimmed its 2013 forecast to 3.8% from 4.2%. All of this data is consistent with a worldwide synchronized slowdown. Europe is likely to experience the most abrupt slowdown compared to the U.S. and Asian economies. In my ROTH IRA, I elected last Wednesday to add some income oriented ETFs. I am basically using some of the proceeds from bond redemptions this month to buy income generating ETFs. I still have in that account an unusually high cash allocation. I would add an important caveat about bond funds. They are not something that I will want to own when the worm turns, and it will turn probably with a vengeance given the length of the current long term secular bond bull market and the current abnormally low yields. The ten year treasury note closed yesterday at a 1.479% yield. If the rate rose to 4% for new ten year notes in 2014, for example, an investor still holding that 10 year note bought at 1.478% yield would be experiencing a lot of hurt. Impact of Rising Rates on Bond Prices In that post I referenced a newsletter from T.Rowe Price (2010) which highlights the risks of rising rates by showing how much values would decline for incremental interest rate increases. In case I have left any doubt in anyone's mind, I am not bullish about stocks at the moment. I am far more concern about the downside risks. I am sitting on a lot of cash in brokerage accounts. In 2007, I raised a lot of cash too, but back then a money market fund was yielding over 4% and I was able to buy shorter term "A" rated or better bonds yielding over 5% with cash raised by selling stocks and stock funds. The fact that I am sitting on more cash earning nothing now is a clear manifestation of my caution and concerns. It is also a reflection on how well I did by redeploying that cash starting in early March 2009, as documented in this blog. I quit making contributions to my IRAs in 2010. For a long time, I funded those contributions entirely from my main taxable account. I see no reason to add more funds to either the regular IRA or to the ROTH given my financial situation. If I had to add to either the Regular or the ROTH IRA, I would add only to the ROTH IRA which, unlike the regular IRA, has no age requirements on withdrawals. For me, I have no plans to ever touch the funds in the ROTH IRA and would want the value of that account to appreciate without withdrawals for as long as possible just in case I unexpectedly need those funds. This ETF will own both trust preferred and equity preferred securities. There are some senior bonds included in the portfolio. Many of the trust preferred securities are being called now, particularly those issued by large financial institutions, after financial reform legislation phased out their use as Tier 1 equity capital. Dividends are paid monthly at a variable rate. The last payment was for $.08107 per share. The ex date will be the 15th day of each month or the last business day prior to the 15th when the 15th falls on a holiday or the weekend. The pay date will generally be the last business day in each month. This is a link to the PowerShares Exchange-Traded Funds | PGX - Preferred Portfolio Holdings. PowerShares Preferred Portfolio ETF (PGX) rose 3 cents in trading yesterday to close at $14.7. PGX is ex dividend today for its monthly distribution of $.0798 per share. 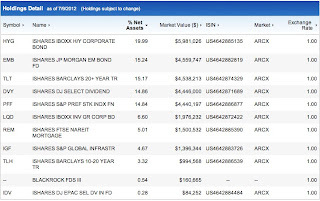 Of the ETFs owned by IYLD, I only own 200 shares of REM, with 100 of those shares held in the same ROTH IRA account. 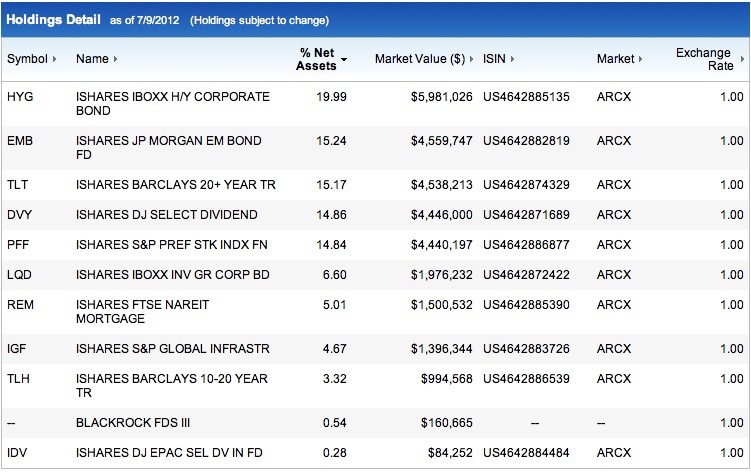 iShares FTSE NAREIT Mortgage PLUS Capped Index Fund (REM is a high yielding security (over 12%). I am uncomfortable buying TLT and TLH, two other IYLD holdings, at their current price and low yield levels. Both of those funds invest in longer term treasury notes and bonds. I have been wrong about those ETFs for more than a year now, however, as they continue to rise in price and decline in yield. Another holding, iShares iBoxx $ High Yield Corporate Bond Fund (HYG) has a 6.84% yield according to Marketwatch based on its closing price yesterday of $90.81. iShares JPMorgan USD Emerging Markets Bond Fund (EMB) has a 4.6% yield; iShares S&P U.S. Preferred Stock Index Fund (PFF) had a 6.3% yield; iShares iBoxx $ InvesTop Investment Grade Corp. Bond Fund (LQD) was at 3.95%; iShares S&P Global Infrastructure Index Fund (IGF) was at 4.06%; iShares Barclays 10-20 Year Treasury Bond Fund (TLH) was at 2.1%; iShares Trust Barclays 20+ Year Treasury Bond Fund (TLT) was at 2.49%; and iShares Dow Jones Select Dividend Index Fund (DVY was at 3.82%, all according to Marketwatch and based on yesterday closing prices. I would guess that IYLD will end up having a yield somewhere in the 5.5% to 6.5% range. I may average down by buying another 50 when and if the price falls below $25. I will jettison the shares whenever I become concerned about interest rate risk. iShares Morningstar Multi Asset Income Index Fund (IYLD) rose 5 cents to close at $26.07 last Wednesday. This ETF fell 13 cents in trading yesterday. 3. Supervalu (own 3 senior unsecured bonds: Junk Bond Ladder Strategy): I thought the earnings announcement from SuperValu was ominous. SUPERVALU reported net sales for its 2013 F/Y first quarter of $10.6 billion and net earnings of $41 million or 19 cents per share, down from 35 cents per share in the year ago quarter. The consensus estimate was for 38 cents on revenues of $10.81, so this is a bad miss. The common shares, SVU, fell almost 50% in value yesterday. I am raising my risk rating for the long SVU bonds to 7+, and the shorter term ones, maturing before 2020, to 6-. Personal Risk Ratings For Junk Bonds I had previously rated the shorter term bonds at 2 and the long bonds at 4-. Part of that change is due to the substantial decline in earnings for this last quarter, along with the meaningful revenue decline year-over-year. Another reason for the increase in risk ratings is that a reasonable forecast is a continuation of that trend. A summary of the negativity can be found in a WSJ article. Cash flow from operations was reported at $227 million for the first quarter. The company intends to reduce debt during the current fiscal year by $400 to $450 million and by $400 million "annually thereafter". The company is also going to end its senior credit facility and replace it with an asset backed lending facility and term loan secured by a portion of SVU's real estate. Debt is the main problem. The company has engaged Goldman Sachs and Greenhill & Company to initiate a review of strategic alternatives. The CEO said on the conference call that a bankruptcy is not one of those alternatives. I would hope that a leveraged buyout is out of the question too. After reviewing these negative developments, I wanted to evaluate precisely where I stood with my SVU senior unsecured bonds. My total cost for those bonds, excluding accrued interest paid to the seller and including the brokerage commission, was $2,405.50 at the time of purchase. One of the bonds, the one maturing in 2026, has a total cost of $802 and is held in the ROTH IRA. Excluding interest payments and realized market discount income, my net profit on those four bonds was $175.83. I did not compute the interest payments received to date, net of accrued interest paid to the sellers, but would guess that the total would be in the $200-$300 range. The 2014 and the 2016 maturities, both more actively traded than the long SVU bonds, closed at 101.05 and 96.250 on 7/11/12 respectively, just prior to the earnings warning made after the close of trading that day. The trading on the 2016 was in the 101-104 range before large orders were filled around 96 near the close of trading. I sold the 2016 bond at 104.125 last November. Yesterday, there were trades below 90 in this maturity. I may buy one more SVU bond, provided I can pick up either the 2014 or the 2016 maturities at attractive prices. I would prefer buying the 2014 below 90, but the 2016 will likely give me significantly more yield with a couple of more years of risk. So far, the bonds have suffered meaningful declines after this announcement. I doubt that the prices have stabilized after a one day swoon. The perception may be that the earnings problems are likely to become worse under the cockroach theory of earnings misses.